My 7 year old sat down and built a little robot from instructions listed at Microsoft's IoT Hackster site. A ball caster, like this for the front "wheel." A Digital switch, like this. You can actually skip this if you want to, it's not require just to move the robot. Screws, Nuts, Bolts and standoffs like this. This was a little bit of a challenge for us, as the screws I got for the axels of the wheels weren't long enough. You may need to make a few short trips to your local hardware store. Raspberry Pi 2, a 2 Amp power supply, SD card, network Ethernet cable. I actually ended up using a portable battery that I use to charge my phone. Starting with a Raspberry Pi 2, walk through the setup instructions here. You do need to have a Windows 10 today to installing Windows 10 IoT Core but at least it's gotten a lot easier with the latest build for IOT. There's an app that does all the work and you don't need to go to the command line. 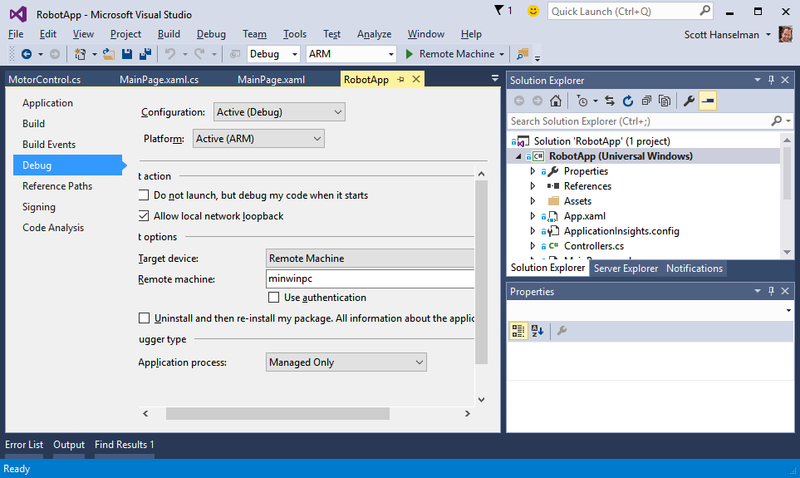 Also get Visual Studio 2015 Community and the Windows IoT Core Project Templates. Basically just follow these step-by-step instructions. Once you have the Raspberry Pi 2 loaded and you've got VS, the code for the robot is here on GitHub. The instructions don't include a photo with pinout information, so someone else who completed the project took pictures of the correct orientations for pins. A few things about Windows 10 IoT Core on small devices like this. It's NOT "desktop Windows." It's not full Windows with a Store and Office. You CAN run Universal apps and they can have a UI. In fact, the robot app can run on your PC and control the robot remotely, OR it can run the same app on the Raspberry PI and control it from there. Here in VS2015 you can see under Debug the name of my Raspberry PI ("minwinpc") and that I'm targeting it remotely and as an ARM device. I was having so much fun working on assembling this that after the kids went to bed I did a 30 min Google Hangout/YouTube and demonstrated the whole thing. You can watch that here, below. Please also take a moment and subscribe to my YouTube Channel. Check out http://microsoft.hackster.io and http://idevthis.azurewebsites.net/ for more projects, code, and inspiration. Have you built anything? Scott, I noticed deployment took a while for your universal app. How long does it take the 2nd time you deploy it? What was the total cost of all the parts? which file from the github link did you upload to ponoko.com for cutting the pieces? I love this project, thanks for making it and showing it to be. I learn better from videos. I have access to a laser cutter, so I am make the parts. This is an awesome project, I didn't believe all the things that Microsoft said about Windows 10 but now, I really think it can be something amazing ! As always, both fun and informative. 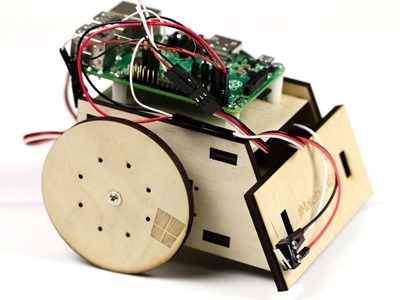 Were you able to get the robot to work with the Xbox 360 controller with the newest release of Windows 10 IoT core? I am having trouble getting the Raspberry Pi 2 to recognize the controller. If you installed the PC app on several PCs could they all control the same robot? Hi Scott, thanks for the great video! I'm getting started with Win10 IoT on the Pi and as you may know, the Pi does not have a clock. I'm unable to find out how to turn on internet time sync, and I can't find yet if Win10 IoT supports the add-on clock module that can be purchased. Do you know if either are supported or how we can find that out?